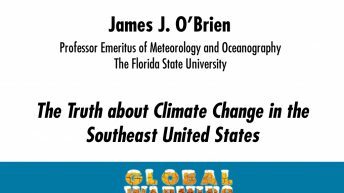 James J. O’Brien was Robert O. Lawton Distinguished Professor and professor emeritus of meteorology and oceanography at The Florida State University and retired director of its Center for Ocean-Atmospheric Prediction Studies. He was a physical scientist in oceanography and meteorology for more than 40 years, modeling timedependent ocean motions, understanding of El Niño, and applying El Niño-Southern Oscillation (ENSO) forecasts to the United States. O’Brien is a fellow of the American Association for the Advancement of Science, American Geophysical Union (AGU), American Meteorological Society (AMS), Royal Meteorological Society, and Oceanographical Society of Japan. He received numerous awards for his work, including in 2006 a medal from the Florida Academy of Sciences and the UDA Prize from the Japan Oceanographic Society. 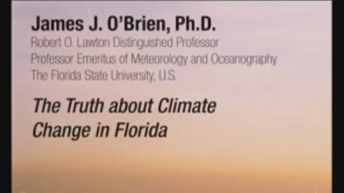 O’Brien was appointed State of Florida Climatologist in 1999 and served on the Florida Commission on Hurricane Loss Projection Methodology from 1999 to 2005. He served on scores of committees with the AGU, AMS, Goddard Space Flight Center, National Academy of Sciences, National Aeronautics and Space Administration, National Climatic Data Center, National Oceanic and Atmospheric Administration, and Scientific Committee on Oceanic Research and was published hundreds of articles in peer-reviewed journals.